On the news this morning, they reported that roughly 36% of Americans are obese. In an effort to curb obesity in this country, First Lady Michelle Obama and NYC Mayor Michael Bloomberg have launched campaigns against fast food, advocating exercise, and encouraging us to get up off the couch, toss the cigarettes, and MOVE! They have both met with resistance from those who feel that it's not the government's place to tell us what to eat or drink or whether or not to smoke. Nobody likes being told what to do - even when what you're being told to do is good for you. But, if those opposed to the "Get Fit" philosophy are honest with themselves, something is very wrong with how we are choosing to disregard the concepts of health and fitness in this country. How many times has a commercial come on depicting skeletal citizens of impoverished nations, weak and hungry, the announcer telling you that for mere pennies a day you can help feed them? Did you look down at the pint of ice cream in your lap with shame? Have you noticed that despite the images we see each day of celebrities with hourglass figures and size zero wardrobes, most of the people you know personally are overweight? Did you know that a size twelve is the real average size for women in this country? As kids, we are required to take health classes to learn how to care for our bodies from the inside out. We had to take gym classes, whether we liked it or not. As a result, most of us were thinner as kids than the current generation of youth. Look in any classroom in America and the skinny kids are outnumbered. Parents are guilty of packing their family's diets with fatty foods, fast foods and high caloric content. 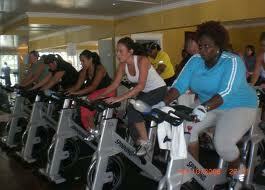 Most of us (especially those of us in urban communities), do not practice a regular fitness routine. Let's face it, most of us haven't seen a gym since high school! About a year ago, I decided to change that. I wasn't thrilled with how my clothes fit or how I felt after running for the ferry, or after walking up a flight of stairs, or even after (*ahem*) other activities. :) So I made up my mind that it was time to make a change. I started walking more and driving less. I started getting up earlier on the weekends to go for a light jog in my favorite neighborhood park. I stopped eating so much sugar, sweets, and starches and replaced those things with water, fruits and salads. Eventually I added hot yoga classes and a boot camp with some girlfriends. And before long I was feeling (and looking) better than ever. I won't pretend that I've been 100% consistent. I used to work out relentlessly, at least five times a week. Lately, I'm lucky if I work out twice a week. Like many people, the winter months are my "license" to snack as often as I wish, while hiding behind sweaters and blazers. But after hearing the statistics on the news this morning (and getting mercilessly SLAUGHTERED on the basketball court by my 16 year old son over the weekend, leaving me a sweaty mess, gasping for air), I have renewed my commitment to being in the best physical shape of my life! Exercise doesn't have to be terrible. Find an activity you love - walking, skating, biking, rollerblading, tennis, basketball, swimming, dancing - and just do it! Once you make up your mind to get active, eat right, and resolve to stick with it, you will be unstoppable! And you might even surprise yourself and love it. All you've got to lose is that extra half-a-person you've been carrying around for the past ten years!